The cello part for Brahms' Concerto for Piano No. 2, Op. 83 in B flat major has been edited by Ronald Leonard, principal cellist of the Los Angeles Philharmonic from 1975 until 1999. Leonard's bowings, fingerings and other editorial markings have been added throughout the score. Concerto for Piano No. 2 is separated by a gap of 22 years from the composer's first piano concerto. Brahms began work on the piece in 1878 and completed it in 1881 while in Pressbaum near Vienna. The premiere of the concerto was given in Budapest on November 9, 1881, with Brahms as soloist. 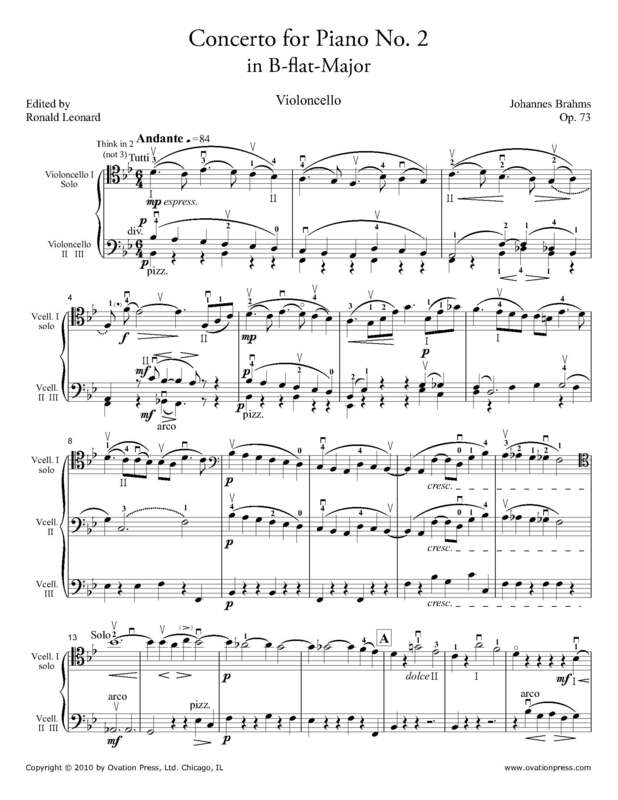 Download and print the score today to gain access to expertly edited Brahms' Concerto for Piano No. 2 cello fingerings and bowings from Ronald Leonard! Please note: This edition is the third movement Andante (cello solo).